This blog post was co-authored by Michelle DeWitt and Amber Jourdan. While meeting in December of 2017, the United Nations General Assembly proclaimed 2019 the International Year of the Periodic Table of Chemical Elements (IYPT 2019). This year coincides with the 150th anniversary of the discovery of the Periodic System as developed by Dmitry Mendeleev. The International Union of Pure and Applied Chemistry (IUPAC) is celebrating IYPT 2019 as it marks its own 100th anniversary. This will be a year of celebrating and promoting the importance of the Periodic Table, and its applications and connection with all areas of science. 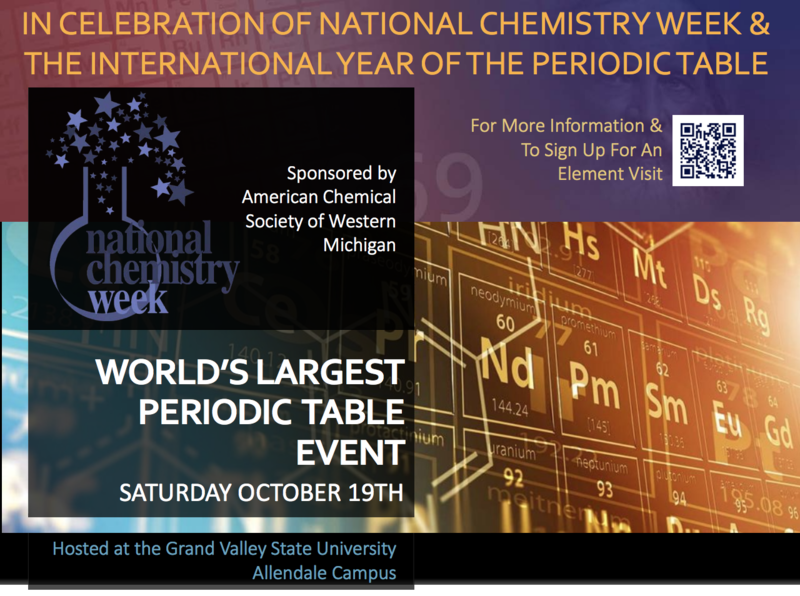 The American Chemical Society Western Michigan Section, has been involved in promoting National Chemistry Week (NCW) for many years. Most recently, they have hosted Chemistry at the Mall and the local ACS illustrated Poem Contest. This year, they are planning a special IYPT celebration to be held at Grand Valley State University (GVSU) in Allendale, Michigan (see Figure 1). This event will be FREE and open to the public. The highlight of the celebration will be the unveiling of the world’s largest periodic table. 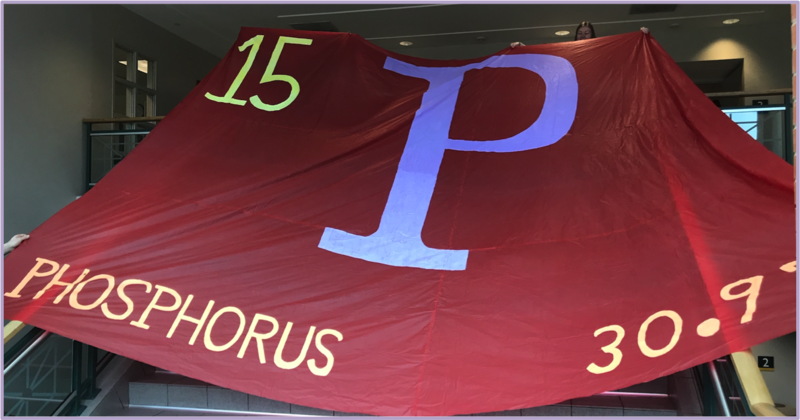 Schools, groups, and local companies are making HUGE elements (216 inches across by 162 inches tall), and when put together they will make a table that is 108 yards long by 53.3 yards tall, almost as big as a football field! The organizers have applied to the Guinness World Records in hopes of establishing this table as the largest in the world. As of April 8th, there are only 39 elements left to be claimed out of the 118 elements that make up the Periodic Table of Elements. The organizers are looking for groups to take on the task of making an element and participating in the creation of the World’s Largest Periodic Table for the IYPT. Near or far, any groups who want to participate are more than welcome to. There are 17% completed and returned to date. Each one different and creative in their own way. As elements are being finished, the organizers are collecting them and preparing for assembly of the World’s Largest Periodic Table. Photos are taken each time an element is added to the collection as a way of keeping track of the elements that have been received (see Figure 2). There have been multiple local schools, businesses, and groups participating in the event thus far. Thanks to ChemEd X we have had a number of schools and groups from outside Michigan claim an element, make it and return it to GVSU. A duo all the way from Texas, John J Glover and Risa Diamond, created an entry for Phosphorus and sent it in. They are hoping to book flights and attend the event on October 19, 2019 (see Figure 3). 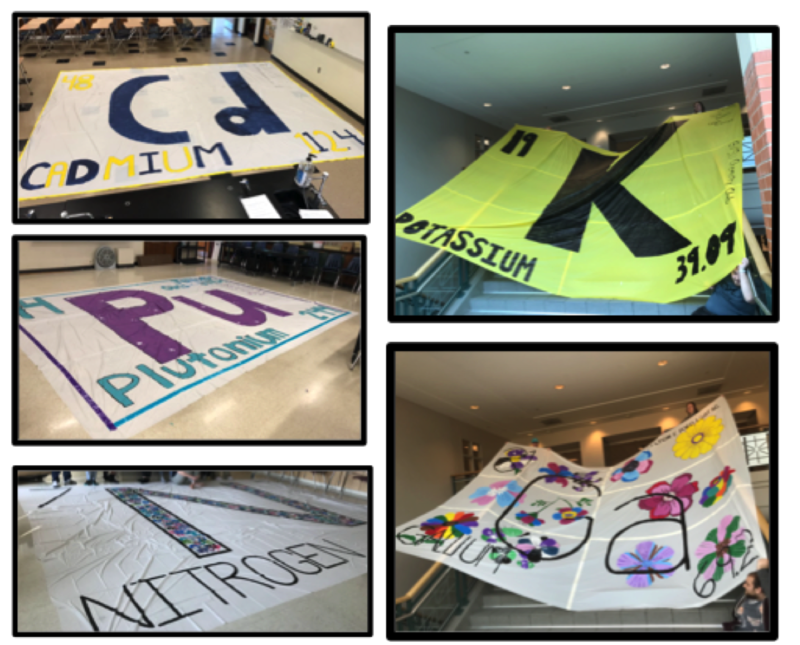 In addition to the Largest Periodic Table project, there will be a demo show, 16 tables with hands on activities, a college poster display, and a K-12 illustrated poster contest. The celebration is planned for 10am to 2pm at the GVSU Kelly Family Sports Center (see Figure 4). Michelle DeWitt has been an ACS member for 26 years and has been actively involved in the local section governance and outreach for most of that time. She is the lead chemistry laboratory supervisor for GVSU. DeWitt is spearheading this project and is the lead contact for schools and other groups interested in participating by putting together an element to be included in the table. Due to the time required to put together each element, the event committee needs to have an accurate account of how many elements are complete with enough time to make a plan for completing any remaining elements, so the elements need to be delivered to GVSU by May 1st (or at a later date if discussed with Michelle DeWitt). Figure 5: The status of elements for the West Michigan ACS IYPT event as of 4/5/19. 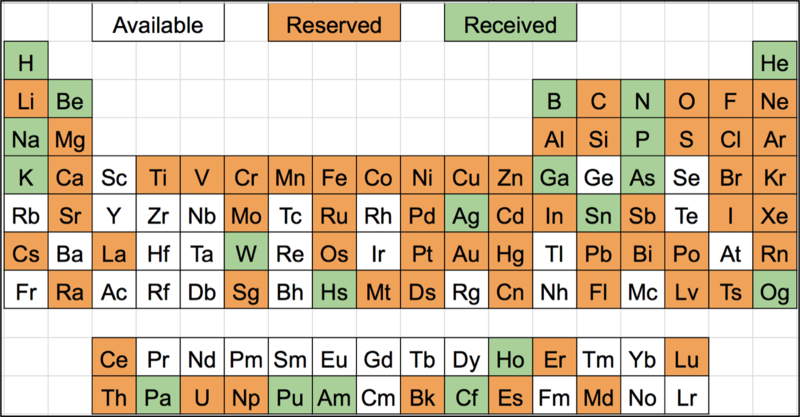 View this list to see what elements might by available currently (see Figure 5). If your group would like to make an element, reach out to Michelle DeWitt: dewittmi@gvsu.edu. Read the Participation Details pdf below for important details. This blog post is co-authored by Michelle DeWitt and Amber Jourdan. This is an update to a previous ChemEd X article about the event: Largest Periodic Table - World Record Attempt published 1/30/19.